Plot: Shaft is the next chapter in the film franchise featuring the coolest private eye on any New York City block. JJ, aka John Shaft Jr. (Usher), may be a cyber security expert with a degree from MIT, but to uncover the truth behind his best friend’s untimely death, he needs an education only his dad can provide. Absent throughout JJ’s youth, the legendary locked-and-loaded John Shaft (Jackson) agrees to help his progeny navigate Harlem’s heroin-infested underbelly. And while JJ’s own FBI analyst’s badge may clash with his dad’s trademark leather coat, there’s no denying family. Besides, Shaft’s got an agenda of his own, and a score to settle that’s professional and personal. 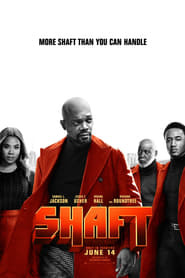 It's Shaft, the sequel to Shaft, which is a reboot of Shaft. It's my duty, to tap that booty.